I think this lily of the valley invitation suite by Crane & Co is the perfect combination of sweet and sophisticated. The sunny yellow and charcoal grey palate is effortlessly elegant and perfect for a traditional but unfussy fête. Very elegant. Love the match box... you don't see a lot of that anymore (surtout in the US). Lily of the valley and forget me nots are my favorite flowers! And poppys! ...Did you see you won the tea towels giveaway? Yay! I adore Lily of the Valley, and this suite is so lovely! I so love this! It's definitely giving me some ideas for my dinner parties! 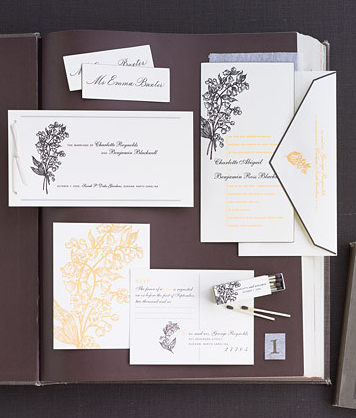 This invitation suite is so timeless and elegant. Too lovely! I love these two colors together! So pretty! Gorgeous. Yellow and grey = one of my favorite color combos! It is absolutely gorgeous indeed! Aw, Lily of the Valley reminds me of my grandmother, as that was her perfume!